The benefits of indoor-outdoor living are clear the tranquillity of nature and the beauty of fresh air brought right into your home but it can be tough to feel connected to the outdoors in a more urban environment. A great way to boost the link between inside and out is with seamless flooring that bridges the gap by creating visual harmony. Check out these nine ideas. 1. Bring the outside in. A great way to make your interior feel as if its outside is to choose a material you would typically use on a patio, like flagstones, and use them for your interior flooring too. This works particularly well in a solarium addition. Flagstones are porous, so they will require a sealant. The sealant will help protect the stone from the elements outside, and from stains and other damage in your kitchen or living space. Choose a solvent-based sealant for outdoors you can use it indoors too. 2. Blur the boundary. 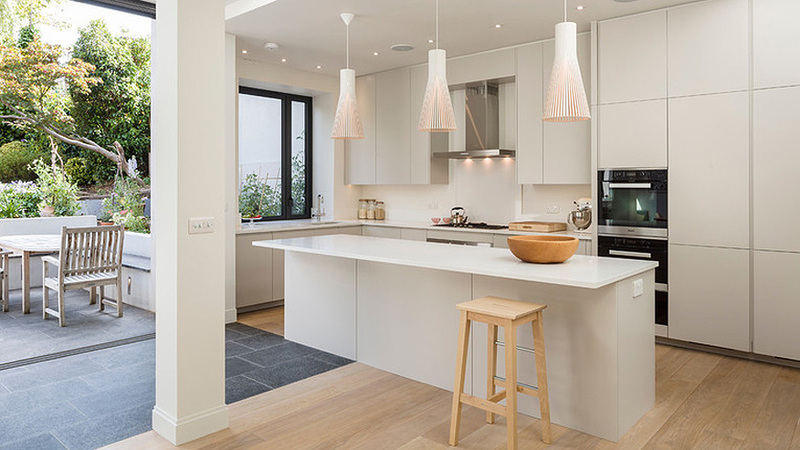 A clever design trick is to use one material for the majority of the kitchen and then just a few feet before the kitchen ends switch material to the same or similar as your outdoor flooring. Its the perfect way to create a pleasing visual confusion between inside and out. Tailor the materials to suit your design, from teak flooring with limestone tiles inside, external slate tiles with wood-effect panels, or perhaps even a herringbone brick pattern with parquet flooring inside. 3. Follow the grain. Its unlikely you’ll find a wood you want to put indoors that will also work outdoors. Many of the woods typically used in interiors, such as oak, pine, and ash, just aren’t weatherproof enough for external use, and it’s unusual to see the more durable hardwoods, such as teak and ipe, used indoors. If you’re set on using natural woods for both indoors and out, you may find that you have to go for different types. But you can create a sense of cohesion by ensuring that the planks run in the same direction (toward the garden will lead the eye out) and are cut to the same width. You could try a weathered teak outside and silvery pine inside, or a white oak with cypress decking, or you may want to contrast a silvery wood, such as weathered teak, with something a little richer, such as oak. 4. Try a wood-look material. If you love the look of real wood but would prefer something properly weatherproof and hard-wearing, choose from one of today’s wood-effect options that can work as well outside as in. You could go for wood-imitating porcelain tiles, or try specialist exterior wood veneer panels, such as those by ProdEx, which have a real wood surface but a Bakelite core. Pick from a range of wood effects, from silvery Scandinavian pine to rich, red-toned cherry. 5. Keep it simple. If you’re after a functional floor that doesn’t draw the eye too much, go for a natural stone or natural-effect tiles. It would be easy enough to continue this into your garden and really give the outside space the sense of being an additional room on the house. Hard-wearing porcelain tiles are a brilliant choice for bridging inside and outside spaces since they are tough, weatherproof and widely available with a slip-resistant finish very handy for the garden element. 6. Go for all-over gray. Dark gray floor tiles, perhaps a slate or another dark stone, are great for connecting indoors without. They offer a sleek contrast to greenery outside and look smart inside plus they’re less likely to show muddy footprints! Travertine and slate work particularly well outside, thanks to their durability, but you can use limestone and sandstone too just make sure that they’re properly sealed, and remember to use a solvent-based sealant rather than a water-based one. All natural stones benefit from sealants, but be wary of using granite and marble outside, since they can be very slippery when wet. 7. Say yes to concrete. You don’t necessarily need identical floor finishes stretching from indoors to out to create a breezy, free-flowing space if you choose matching tones. You can use the same material features in two different formats. 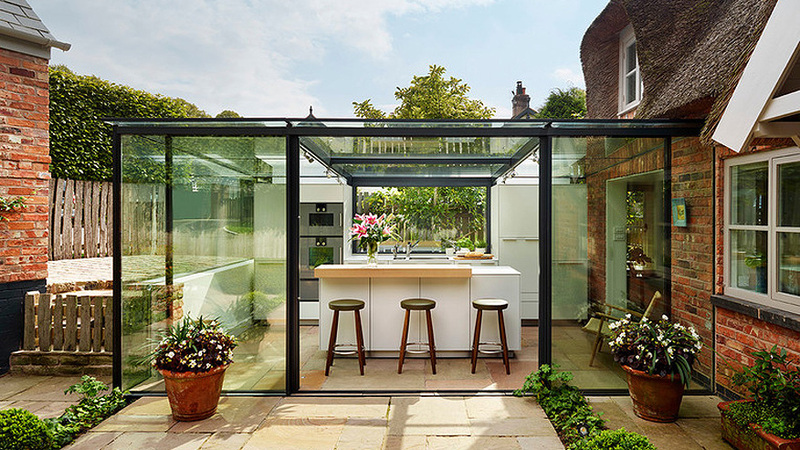 For example, a poured concrete floor inside the kitchen area is chic and urban and can merge almost seamlessly with oversize paving slabs, in the same pale gray, that cover the garden patio. A concrete sealant will make it weatherproof and help to protect it against grease, oils and other spills. It can be applied by roller or spray to dry and completely cured concrete (allow at least 28 days after its laid). Its best to go for two thin and even coats, applying the second one in the opposite direction to the first. 8. Enhance a garden room. 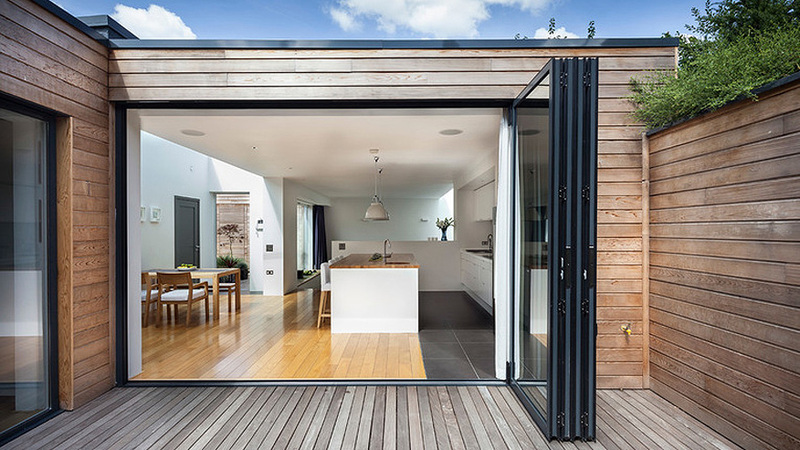 If you’re lucky enough to have a garden room or converted shed, enhance its mood by extending the floor out to skirt the building so that when the doors are thrown open wide, you can’t quite tell whats inside and whats out. Remember to choose a material that can work both inside and out, which may mean a treated natural stone, a weatherproof wood, porcelain tiles or specialist exterior vinyl tiles. 9. Stick to the same palette. If you’re looking to create a connection between inside and out, but don’t want to go for exactly the same material or style, create the connection by choosing materials in the same tonal color palette. Indoors, opt for patterned porcelain or cement tiles that draw out something of the natural stone used outside, or vinyl flooring in a similar color palette to a hardwood deck.